The average monthly income per agricultural household from all sources is estimated to be Rs. 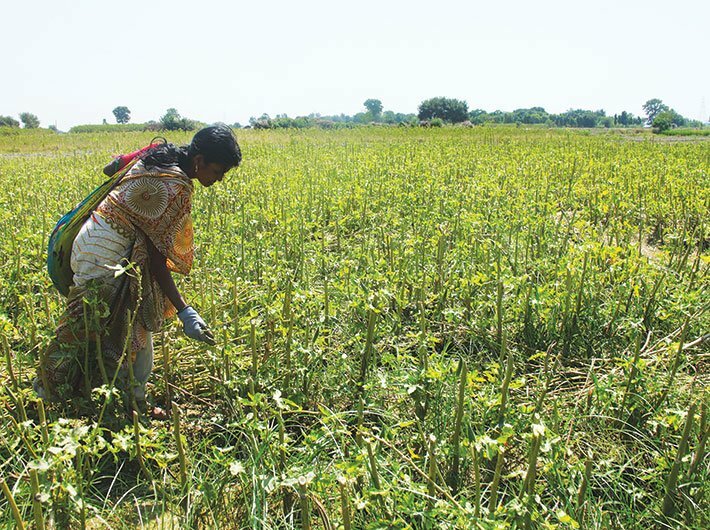 6,426, according to the latest “Situation Assessment Survey of Agricultural Households” conducted by National Sample Survey Office (NSSO) in 2013. However, NSSO has not conducted any such survey since 2013 and as such the estimates for rise in income of farmers during 2014 to 2017 are not available, union minister Radha Mohan Singh informed parliament. The minister said that the government is focusing on four major aspects to achieve the goal of doubling farmers’ income by 2022. These include: reducing input costs; ensuring fair price for the produce; reducing wastage; and creating alternate sources of income. An Inter-Ministerial Committee has been constituted under the chairmanship of CEO, National Rainfed Area Authority on April 13, 2016 to examine issues relating to doubling of farmers’ income and recommend a strategy to achieve the same by the year 2022. He said that the government is implementing various schemes/ programmes to strengthen storage infrastructure for procurement of crops in the country. The subsidy linked Central Sector Scheme, i.e., Agricultural Marketing Infrastructure (AMI), sub scheme of Integrated Scheme of Agricultural Marketing (ISAM), is being implemented by the ministry of agriculture & farmers’ welfare in order to improve/create scientific storage capacity for storing farm produce, processed farm produce and to reduce post-harvest storage losses. Under this scheme, 65.14 Million MT storage capacity has been sanctioned so far (as on January 31, 2018). Against the overall storage capacity required for the central pool of foodgrain of about 600 lakh metric tonnes, the total capacity available with Food Corporation of India (FCI) and state agencies for storage of foodgrain as on January 31, 2018 is 735.46 lakh metric tonnes. However, to augment capacities in specific areas and to modernize the storage facilities in the country, the government is implementing Private Entrepreneurs Guarantee (PEG) Scheme; Central Sector Scheme for Construction of Godowns in North Eastern States along with Himachal Pradesh, Jharkhand and Kerala; and Action Plan for Construction of Steel Silos. The minister said that the union government is implementing various schemes/ programmes to promote non-farm employment opportunities for the farmers. In particular, ministry of food processing industries is implementing Scheme for Creation of Infrastructure for Agro Processing Clusters under the Pradhan Mantri Kisan Sampada Yojana to incentivise the setting up of 100 agro processing clusters in the country. These clusters would add value to the horticultural/ agricultural produce and reduce wastage of the surplus produce and thereby resulting in increase of income of the farmers and creation of employment opportunities at the local level. With a view to increase benefits of farming to the poor farmers, the government is implementing various schemes and programmes focused on promoting share cropping and encouraging mixed cropping. The major schemes for assisting the farmers in making farming more beneficial are: Crop Diversification Programme under Rashtriya Krishi Vikas Yojana (RKVY); Rainfed Area Development under National Mission for Sustainable Agriculture; National Mission on Oilseeds and Oil Palm (NMOOP); and Sub-Mission on Agro-Forestry. Government has also set up 690 Krishi Vigyan Kendras (KVKs) and 676 Agricultural Technology Management Agencies (ATMAs) at district level for dissemination of technologies among farm community. In addition, farmers are Contd..3/- -3- provided information through Focused Publicity Campaigns, Kisan Call Centres (KCCs), Agri-Clinics and Agri-Business Centres (ACABC) of entrepreneurs, Agri Fairs and exhibitions, Kisan SMS Portal, etc. In addition, a Model Act on Agricultural Land Leasing has been suggested by the NITI Aayog to facilitate the States for enactment of their own land leasing laws. This may facilitate share cropping by encouraging the land owners to lease out without any fear of losing land right; and enabling the tenant farmers to access bank credit, insurance, disaster relief and other support services, said the minister.